Available difference in hydraulic head across a hydroelectric dam, before head losses due to turbines, wall friction and turbulence. Fluid flows from the tank at the top to the basin at the bottom under the pressure of the hydraulic head. Measuring hydraulic head in an artesian aquifer, where the water level is above the ground surface. Hydraulic head or piezometric head is a specific measurement of liquid pressure above a vertical datum. It is usually measured as a liquid surface elevation, expressed in units of length, at the entrance (or bottom) of a piezometer. In an aquifer, it can be calculated from the depth to water in a piezometric well (a specialized water well), and given information of the piezometer's elevation and screen depth. 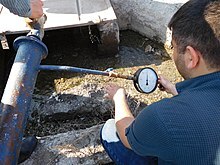 Hydraulic head can similarly be measured in a column of water using a standpipe piezometer by measuring the height of the water surface in the tube relative to a common datum. The hydraulic head can be used to determine a hydraulic gradient between two or more points. In fluid dynamics, head is a concept that relates the energy in an incompressible fluid to the height of an equivalent static column of that fluid. From Bernoulli's Principle, the total energy at a given point in a fluid is the energy associated with the movement of the fluid, plus energy from static pressure in the fluid, plus energy from the height of the fluid relative to an arbitrary datum. Head is expressed in units of height such as meters or feet. The static head of a pump is the maximum height (pressure) it can deliver. The capability of the pump at a certain RPM can be read from its Q-H curve (flow vs. height). A common misconception is that the head equals the fluid's energy per unit weight, while, in fact, the term with pressure does not represent any type of energy (in the Bernoulli equation for an incompressible fluid this term represents work of pressure forces). Head is useful in specifying centrifugal pumps because their pumping characteristics tend to be independent of the fluid's density. Velocity head is due to the bulk motion of a fluid (kinetic energy). Its pressure head correspondent is the dynamic pressure. Elevation head is due to the fluid's weight, the gravitational force acting on a column of fluid. Pressure head is due to the static pressure, the internal molecular motion of a fluid that exerts a force on its container. Resistance head (or friction head or Head Loss) is due to the frictional forces acting against a fluid's motion by the container. is called the velocity head, expressed as a length measurement. In a flowing fluid, it represents the energy of the fluid due to its bulk motion. is the hydraulic head (Length in m or ft), also known as the piezometric head. In an example with a 400 m deep piezometer, with an elevation of 1000 m, and a depth to water of 100 m: z = 600 m, ψ = 300 m, and h = 900 m.
This vector describes the direction of the groundwater flow, where negative values indicate flow along the dimension, and zero indicates 'no flow'. As with any other example in physics, energy must flow from high to low, which is why the flow is in the negative gradient. This vector can be used in conjunction with Darcy's law and a tensor of hydraulic conductivity to determine the flux of water in three dimensions. Relation between heads for a hydrostatic case and a downward flow case. The distribution of hydraulic head through an aquifer determines where groundwater will flow. 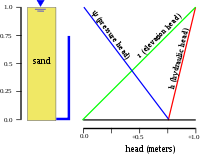 In a hydrostatic example (first figure), where the hydraulic head is constant, there is no flow. However, if there is a difference in hydraulic head from the top to bottom due to draining from the bottom (second figure), the water will flow downward, due to the difference in head, also called the hydraulic gradient. The effects of changes in atmospheric pressure upon water levels observed in wells has been known for many years. The effect is a direct one, an increase in atmospheric pressure is an increase in load on the water in the aquifer, which increases the depth to water (lowers the water level elevation). Pascal first qualitatively observed these effects in the 17th century, and they were more rigorously described by the soil physicist Edgar Buckingham (working for the United States Department of Agriculture (USDA)) using air flow models in 1907. In any real moving fluid, energy is dissipated due to friction; turbulence dissipates even more energy for high Reynolds number flows. This dissipation, called head loss, is divided into two main categories, "major losses" associated with energy loss per length of pipe, and "minor losses" associated with bends, fittings, valves, etc. The most common equation used to calculate major head losses is the Darcy–Weisbach equation. Older, more empirical approaches are the Hazen–Williams equation and the Prony equation. For relatively short pipe systems, with a relatively large number of bends and fittings, minor losses can easily exceed major losses. In design, minor losses are usually estimated from tables using coefficients or a simpler and less accurate reduction of minor losses to equivalent length of pipe, a method often used for shortcut calculations of pneumatic conveying lines pressure drop. ^ a b Mulley, Raymond (2004), Flow of Industrial Fluids: Theory and Equations, CRC Press, ISBN 978-0849327674 , 410 pages. See pp. 43–44. ^ a b Chanson, Hubert (2004), Hydraulics of Open Channel Flow: An Introduction, Butterworth–Heinemann, ISBN 978-0750659789 , 650 pages. See p. 22. Bear, J. 1972. Dynamics of Fluids in Porous Media, Dover. ISBN 0-486-65675-6.